Acoustic insulation is used to reduce noise inside a room such as a hall, or to keep the noise from entering that room. Firstly, a sound wave travelling in the air outside the room may strike the outer wall of the room and set it vibrating, thus passing on and generating a sound wave inside the room. Secondly, machinery operating inside a building can also cause wall vibrations, thus passing the sound waves on. Thus, machinery must be insulated by placement on shock-absorbing materials such as rubber pads. Exactly the same principle applies to noisy wooden (upstairs) floors. However, walls can also absorb and pass on noise that passes through the air. This is why it is necessary in some cases for walls themselves to be insulated, so that the sound waves are absorbed before being passed through. Eco-Insulation has a natural ability to become an integral part of the wall, floor or ceiling by filling all the gaps and irregular spaces and thereby producing a significant improvement in noise suppression. 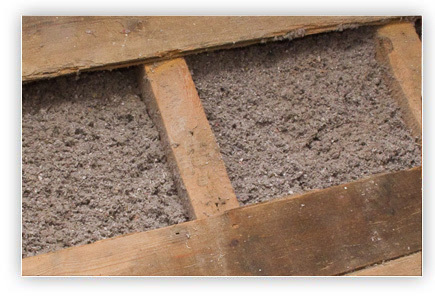 Due to the porosity of its interwoven fibres, cellulose insulation is able to absorb low and high frequency ranges within an enclosed wall or ceiling cavity. Cellulose fibre has a NRC-Noise Reduction Co-efficient of 0.90 (90% of sound energy absorbed). The Noise Reduction Coefficient (NRC) is a scalar representation of the amount of sound energy absorbed upon striking a particular surface. An NRC of 0 represents perfect reflection and an NRC of 1 represents perfect absorption (common definition). Users of Eco-Insulation have the peace of mind of knowing that they are using an excellent product, that also contributes to the environment by supporting recycling and lowering the consumption of electricity.